BlockCBlog.com - BlockCBlog.com Gamecock Blogs and Interviews! I really loved Ray Tanner as a baseball coach. The pressure never seemed to rattle him, his pitchers and certainly not his 2010 infield and 2011 wasn’t bad either. There is finally enough public information to form an opinion on Ray Tanner as an athletic director. We waited some time for him to be faced with a high profile hire, and now it has come and passed twice. Some of what has occurred under Tanner has been great and other moments he looked unsuitable in the role. The first huge accomplishment for Tanner was nailing down both Dawn Staley and Frank Martin. It is true neither coach was hired by Tanner, but he gave them very competitive contract extensions. Frank Martin’s salary rose from 2.1 M to 2.45 million in 2016-2017. Based on those numbers he ranks in the upper tier among basketball coaches in the SEC. One more NCAA run and they will need to push his salary to 3M mark and into the realm of great coaches that are on the fringe of a national championship. Martin’s buyout is 4.8 million this season, 3.5 million the following season, and 1.5 million in 2018-2019. Tanner handled this moment smoothly and locked down his man. Dawn Staley’s new contract runs through 2024-2025, and made her the highest paid women’s basketball coach in the SEC. Coach Staley deserved it and Tanner made sure she got it from South Carolina, that’s a win. The South Carolina athletics programs have greatly benefited from being in the SEC. Some of it was history, and media attention, but mostly it came down to money. The SEC revenue splits are essential to the health and balance of the conference. The ongoing trend is the teams that spend win. When Ray Tanner missed on Kirby Smart and Tom Herman people were upset about the plan C hire of Will Muschamp. Coach Muschamp had been all the right places, and had all the proper experience. He simply needed a second chance and South Carolina was a great fit being the program like Muschamp had not had great recent success but great potential. I am 100 % behind coach Muschamp, and I will be pulling for him as long as he is at South Carolina. That being said when you hire a football coach if you want to win you have to throw your money on the table. Muschamp makes 3.0 Million annually, the university saved just over 1 M per year in the transition from Spurrier to Muschamp. Muschamp ranks 12th, ahead of only Barry Odom among SEC head coaches in 2016. Why does the SEC west always beat the SEC east? The truth is in the money, 7 of the top 8 SEC salaries are coaches from the SEC West. Perhaps Muschamp was the perfect fit for South Carolina but either way there was not enough money offered to attract top talent. It felt like a loss to everyone watching, hoping and anticipating something to celebrate. The assistant football coaches at South Carolina did fare much better. In 2016 Muschamp’s assistants will make 4 million dollars, ranking them competitively 6th in the conference. The athletic department also added a lot of talent to the administrative recruiting office. 11 employees were hired to work behind the scenes helping Muschamp lure in much needed talent. This was needed to keep up with competition. Well done. That’s a winner. Mack Brown recently said that the arms race was once centered on facilities, but now it’s in staff members. Football analyst has become an important term in the world of NCAA football. It’s a vague title with even less specific duties associated with the position. New Texas coach Tom “Prick” Herman plans to hire an army of analyst and support staff. In 2013-2014 Alabama spent 2.7 M on 8 football analysts on the Saban staff. These people can’t be involved in practice, but they can recruit, game plan, and break down film in far greater detail than on field coaches. Committed teams want no stone unturned and they get ahead through choosing to pay administrative employees than other schools don’t. I don’t think the Gamecocks have gotten to this point yet. This is simply another place that if you truly want to win a national championship you must spend money. Ray is losing here. I never thought that I would question a Ray Tanner baseball related decision, but I wasn’t happy with the hiring of Mark Kingston. Coach Kingston has been winning people over, and we will all be behind him when the time comes. Still yet, the teams that win championships and lure in talent like Kevin O’Sullivan, get it done by making offers that simply cannot be refused. It would seem Tanner has been refused 5 or 6 times in the last 18 months. Kingston’s contract is for 475,000 plus 125,000 for media/personal services. That happens to be last in the conference. Ray Tanner has a vision and culture he has built at South Carolina. He has hired coaches based on a personal connection, program management, and student athlete leadership. Can South Carolina win championships based on Ray Tanners ability to identify diamonds in the rough? I don’t think they can. 30 years ago education was more important than big time commercial power 5 sports, but that is not the case now. In the final SEC home game last season against Missouri, with a little over 8 minutes left in the second quarter, Jake Bentley threw a 17 yard touchdown pass to Rico Dowdle and Elliott Fry came in to kick an anything but routine extra point. Fry hit the extra point right down the middle to put the Gamecocks on top 14-7. In the box score it may have only counted as one point, but it was the 331st point of Elliott Fry's career at South Carolina and with that the senior from Frisco, Texas broke the school record to become the all-time scoring leader. Not too bad for a former walk-on. Going from walking on, to earning a scholarship and eventually breaking the school scoring record should come as no surprise after you get to know a little bit about Elliott Fry. After being diagnosed with Type I Diabetes at the age of 7 he has to learn to live life a different way. Over the years, he learned to manage his health while never letting it prevent him from tirelessly working to pursue his dream of playing college football. A typical game day for most players was anything but typical for Fry. He had to take 10 shots before every game and check his blood sugar, sometimes up to five times before kickoff. Fry said, "It’s never something that’s easy, but I do get used to it, and it’s just something I kind of deal with now." Fry never let it stop him or slow him down. Fry also used his success and platform to help others dealing with juvenile diabetes. He has reached out to a lot of different kids and families struggling with the impact of the disease and is an avid supporter of the Juvenile Diabetes Research Foundation. Elliott Fry finished his career with 359 points including a few game winning kicks and proved to everyone including himself that anything is possible if you work hard and never give up on your dreams. We caught up with Elliott Fry as he prepares for the South Carolina NFL Pro Day. BCB: You’re well known for your sense of humor while playing at SC. What is the funniest Spurrier story or moment during your time at South Carolina? BCB: There are several different superstitions regarding kickers before they take the field to kick a FG. Players usually don’t talk to the kicker before they take the field and some coaches choose to use a timeout at the last minute to “ice the kicker” before an important FG. For you personally, is there anything to those pre-kick antics? BCB: You came to South Carolina as a walk on, tell us about the moment when you found out that you’d earned a full scholarship at USC. BCB: You’ve had a lot of memorable kicks at South Carolina, the game winner against Missouri in 2013 and last year to open the season against Vandy just to name a few. 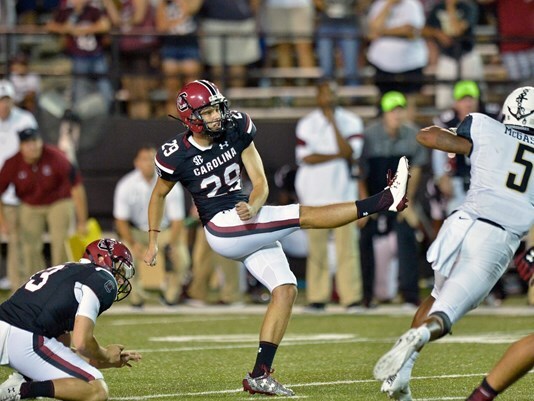 What was the most memorable kick for you personally during your time at South Carolina? BCB: If you had one piece of advice for any incoming recruit coming to play football at South Carolina, what would it be? What is something that you wish someone would have told you when you first arrived at SC? BCB: A holder on placements in college football seems to be a very underrated job. As a kicker, talk about the importance of having a good holder like you had with Patrick Fish. What do you look for most in a holder? BCB: As fans, we have come to know a lot about you on and off the field. What is something about you that most Gamecock fans probably wouldn’t know? BCB: Either in game or during practice or warm ups, what is the longest FG you’ve ever hit? BCB: What would you tell a kid out there who loves to plays sports and wants to play at the next level who has just been diagnosed with diabetes? What would you tell your younger self now, looking back on the adversity you’ve had to overcome to be a successful college athlete? Please considering giving back one in honor of Elliott Fry today, by donating at least $1 to the Juvenile Diabetes Research Foundation using the link below. Tweet us @BlockCBlog with the hashtag #1ForFry after donating!